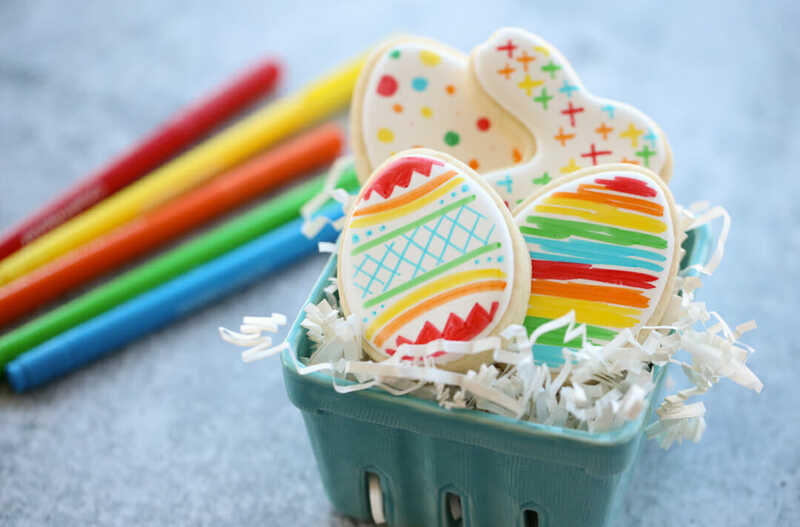 Easter Cookies! I always love the idea of decorating holiday cookies, but the reality is making different color frostings and making something that doesn’t look like a preschooler did it is sometimes challenging! I’ve showed you some hand-drawn cookies before, for Valentine’s Day, and I wanted to do some Easter Cookies this year as well! 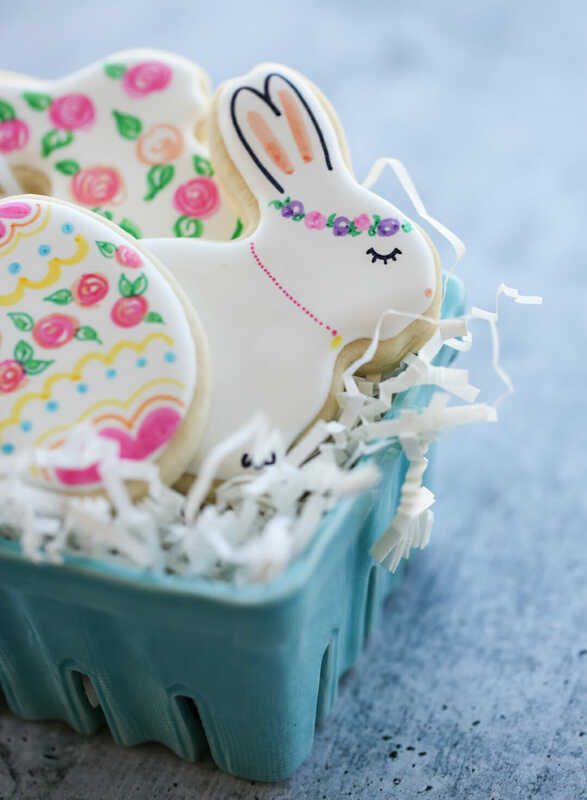 This is a fun method that produces really cute Easter cookies, with minimal effort (and minimal mess!) 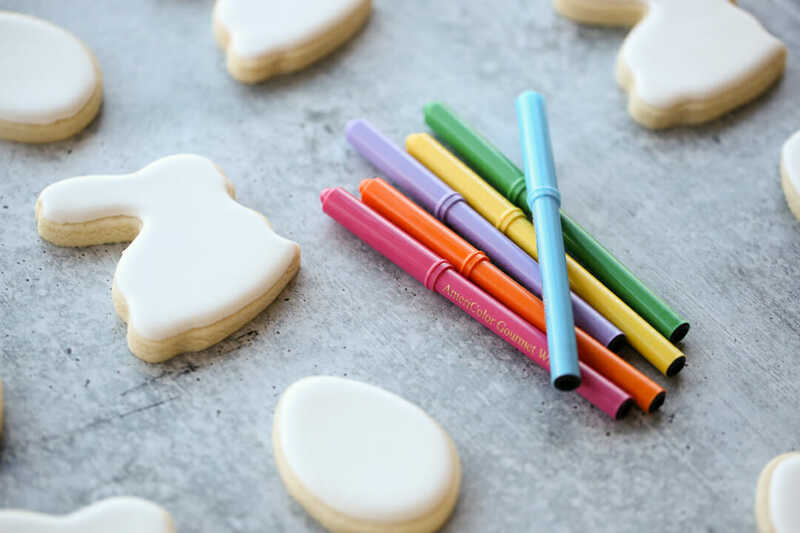 I’m going to show you my shortcut for fun holiday cookies using markers! The first thing you will need is cookies! 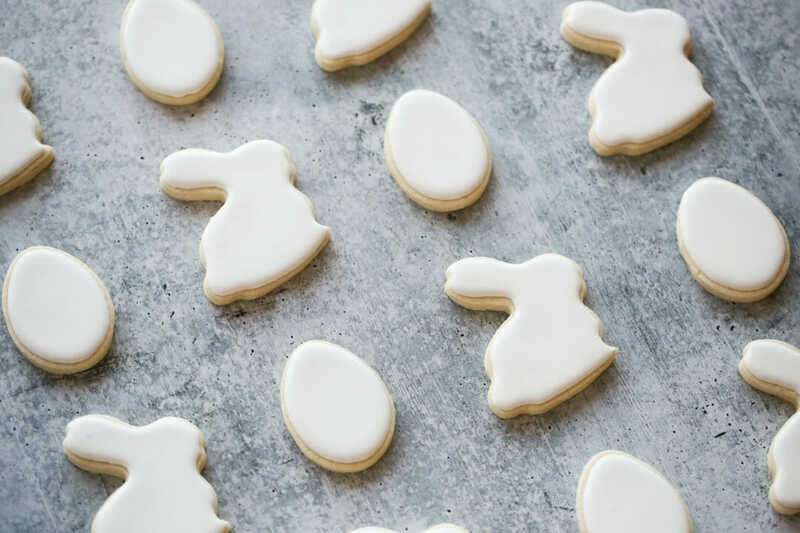 You can bake your own sugar cookies and frost them with royal icing (an icing that dries completely dry and solid), or do as I do and just purchase them ready-made. I bought mine from a local cookie artist RoRo’s Cookies whose profits all go to charity! She did all the heavy lifting and I just picked up some beautifully packaged cookie boxes with these cut-out shapes in plain white icing all ready for me to decorate. The next thing you’ll need is markers with edible ink! Basically these are markers with food coloring as the ink. I just buy mine on Amazon. I have this Americolor set, and I also bought this set because they have dual tips, with one end having a thick brush tip and the other a fine tip. 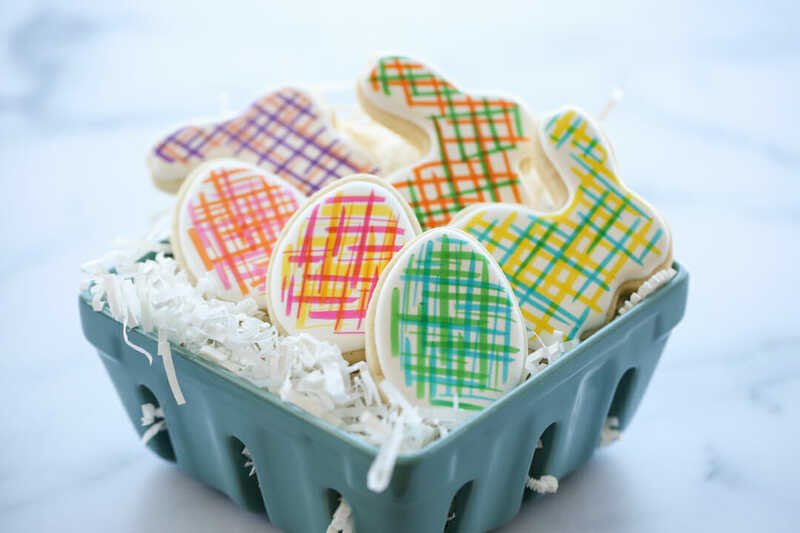 Here’s a few design ideas- these are just several mini-baskets I made with different themes so you could see how easy it is to make cookies to match a tablescape, or an event, or personalize them, etc. This mod black set was all done with just one color (obviously!) 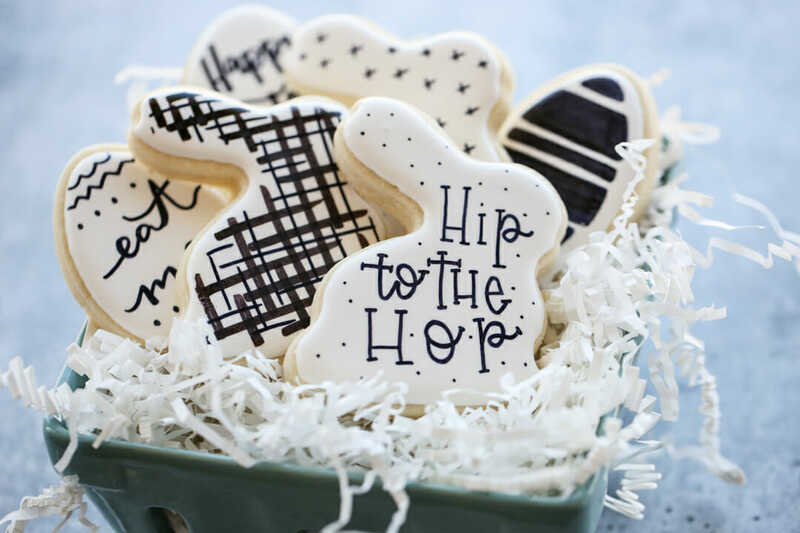 I love black and white cookies and these are especially fun to mix and match with some very simple graphics and text. I would however shy away from heavy designs here (like that almost all-black egg in the photo above) because this IS food coloring, and as soon as it hits your lips it can turn everything black, lol. I’ve loved rainbows since I was a little kid and I’ll always throw in a ROYGBIV when I can! Or in this case, ROYGB haha. Notice I’m not even doing anything fancy or artistic, most of these cookies below are just polka dots, x’s and stripes! The fine-tip markers came in handy for these quick and easy little details on this pretty little princess bunny. I made some larger flowers (which look closely, are really just swirls) to coordinate with this one. Just use the same color scheme and you can mix and match lots of different designs. Lastly, this style requires literally no artistic talent! 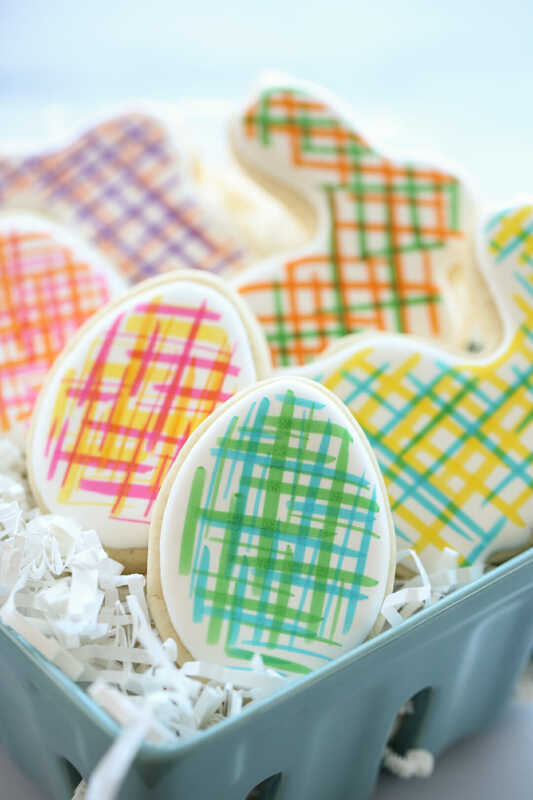 I haphazardly drew lines in both directions on a cookie, using two colors and they came out in the cutest little plaids. 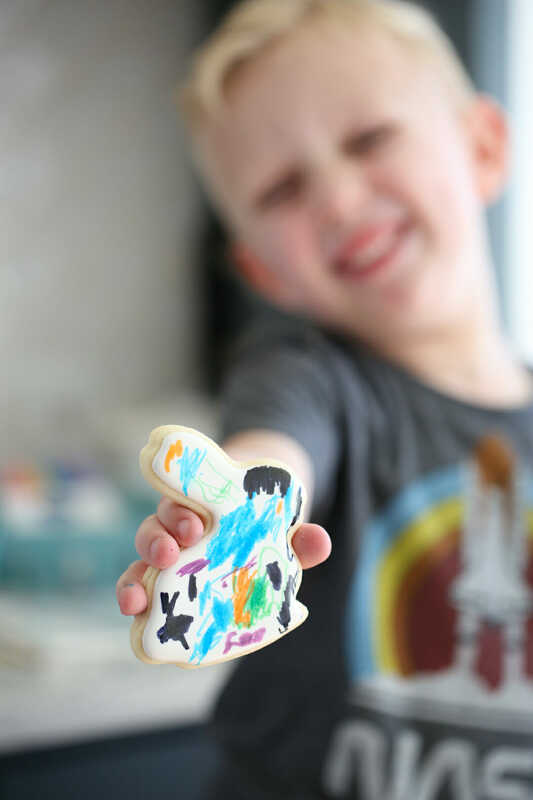 This is hands down one of my favorite ways to do cookie-decorating with kids. Again, this IS food coloring, so younger kids need supervision- and again I would stress light designs so you don’t end up with totally stained faces, but for me it beats the giant mess involved in trying to let kids frost their own cookies with traditional frosting and decorate with candies! 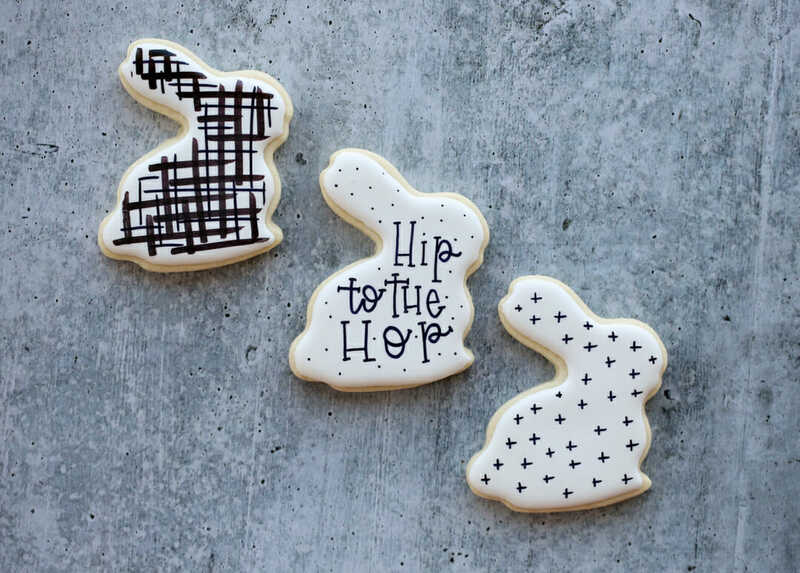 If you try these fun cookies, I’d love to see what you create! Tag me on Instagram so I can see! All of these are so darn cute! 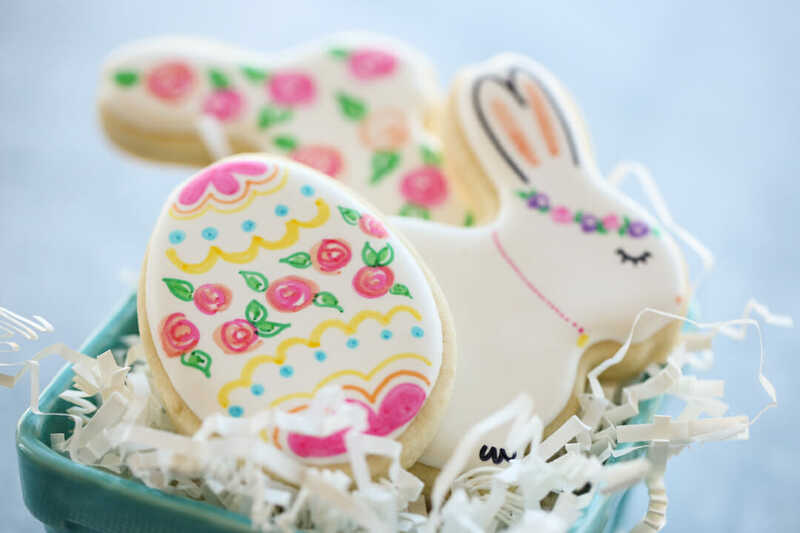 What a great idea to have them pre-made and just enjoy the decorating! Thank you for the great ideas! Haha, I’ve seen it with and without the I! Oh my word how cute are these! And EDIBLE markers?! How on earth did I I not know such a thing existed?? I’m totally buying some! Looks like your link for the dual ended brushes doesn’t work! Would these work on your glacé icing? Not a huge fan of royal icing. Yes, if it’s completely dried and you use a soft touch with the markers. I used this idea from your Valentine’s post for a class party of 5th graders. They absolutely loved it! It was a little pricey investing in the markers (2 sets to have enough for the class), but they work great and should work for class parties to come. Since I think you probably have a lot of Utah-based readers, I thought I would throw out there that I was able to get plain white glace-iced cookies from Granite Bakery in Salt Lake. I’m sure there are other places that do them too, though! I love your recipe for homemade, but was required to have store-bought treats for the school parties. Love this! After you posted the hand painted valentine cookies I hosted a Valentine Party for my 4 year old primary class. They LOVED using the food color markers on the cookies!! I actually bought the pouches of “Cookie Icing” from the store and iced them a day or two before. My advice if you do that is to do it way in advance (like 2 full days prior to your event) – they took awhile to harden completely! And it actually took awhile to ice them (even with the premade icing). But it was so fun and totally worth it! Love your creative ideas! !